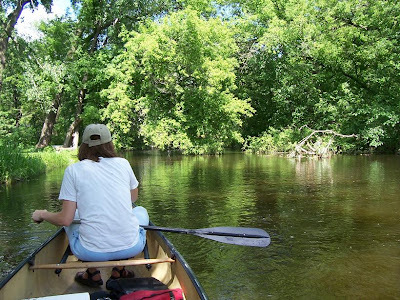 The Rice Creek Water Trail is a 23 mile chain of lakes along Rice Creek between Lino Lakes and the Mississippi River. Mel and I decided we wanted to canoe Lower Rice Creek, which is the portion of the water trail between Long Lake in New Brighton and the Mississippi River. The Rice Creek Watershed District recommends that the river is “canoeable” if the water depths (measured in Mounds View) are above 8.3 feet. Today, water levels were at about 8.07 feet, technically “not canoeable.” [Note that this water depth measurement does not mean that the creek we were canoeing on was 8 feet deep. It means that somewhere else in the watershed district (wherever they take the readings) it was 8 feet. Most of the creek we saw was less than a couple feet deep.] But we decided to take our chances, and found conditions to be fantastic. This might have been my favorite canoe trip in the metro area so far. Rice Creek seems to be moving a little bit more quickly than the Rum River, for example. At one point, Melanie announced that she couldn’t paddle anymore because it hurt her foot too much, so I became her chauffeur. I don’t know, though… I think it might have been a trick. I’m not gonna try and map our canoe route down Rice Creek, but here’s the approximate route I biked back to Long Lake to get the car. While we were canoeing, we noticed a lot of folks cycling along what looked like a pretty neat bike trail through Locke Park. I tried to take that trail back, but took a couple unfortunate wrong turns and got lost, so I just stuck to the streets. 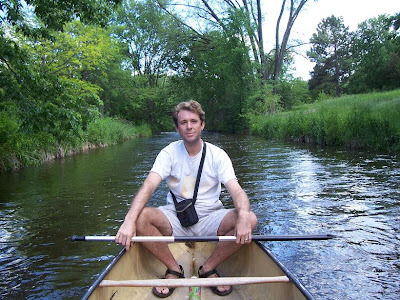 This last weekend, Mel and I canoed down Minnehaha Creek with some friends. It was our third time canoeing the creek. The first time, the water was really high, and it was a pretty wild ride. The second time, the water was way too low. This time, conditions were perfect for canoeing. We started at Synagogue Cemetery on France Avenue in Edina. Construction on the Bryant Avenue Pedestrian Bridge were a pretty big pain, mostly because a fallen tree was stuck underneath the construction, blocking the whole river. At 35W, we found this sign telling us that the creek was closed. We were pretty skeptical that it was actually closed, so we just kept going. Ta Daaaa! Not actually closed! But another fallen tree slowed us down a bit. At the Hiawatha Golf Course, some of the bridges are pretty low and you have to duck under them. UPDATE: go here for Scott and Brittany’s version of this adventure. 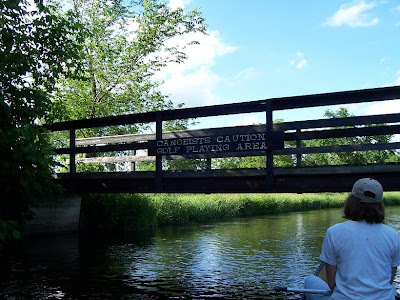 For our adventure this week, we went canoeing on the Wisconsin River near Sauk City, WI. We met up with some friends, and spent two days canoeing about 17 miles (..or was it 12 miles….?). The Wisconsin River is a great place to canoe because the current is strong enough that you don’t really need to paddle. If you’re in the river, you’re moving downstream (mel and I know from experience that this is not the case with many rivers in MN). 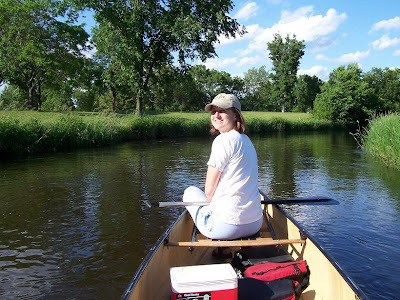 For example, here’s Melanie lounging on the front of the canoe – she isn’t even holding her paddle. Of course, Mel caught me a few times without my paddle, too. The umbrella in the canoe in the background is shielding the youngest member of our group (1.5 years) from the sun. And it wouldn’t really be canoeing without stopping a few times along the way to soak your feet.